An interesting branch of the Hawkwind family tree is Melodic Energy Commission, which included among it membership Hawk electronics maestro Del Dettmar. Moonphase Compendium re-releases on one CD the band's two albums: "Stranger In Mystery" from 1979, and "Migration Of The Snails" from 1980. On both albums the band's lineup consisted of Xaliman on vocals, guitar, piano, electro-keys, gongs, percussion, and shepherds pipes, Randy Raine-Reusch on dulcimer, khaen, gongs, and flutes, Del on EMS synth and Delatronics, George McDonald on guitar, theramin, and wall of oscillation, Mark Franklin on bass, and Paul Franklin percussion, tablas, glockenspiel, and synth organ, plus numerous guests. The CD curiously starts with the second album and is followed by the first, so being a stickler for chronology I've been listening to it starting with track 9. The Stranger In Mystery tracks are interesting as they feature tribal, acoustic, flower power, hippie psychedelia combined with loads of spacerock electronics. The music is raw, but heavily exploratory, often changing radically within a single track. For example, the nine minute title track features acid guitar and synths jamming in their own individual directions in a kind of heavy Hawkwind, floating Tangerine Dream style. The feel is very playful, though it gets a bit meandering at times. Xaliman's slightly efx'd vocals are a bit eerie and fit the music well. Too much is going on for a track by track discussion. But suffice it to say they go from psychedelic chamber orchestra, to dissonant strumming acoustic guitars, and more freaky electronics than you can shake a Hawk at. On their second album (tracks 1-8), the songs are far more developed and have more sense of direction. The vocals, male and female, are a bit on the avant garde - performance art side and some of the music is fusion influenced. "Plight Of The Dodo" is very beat-jazzy with finger-snapping coffeehouse vocals. "Rider From Nempnett Thrubwell" is a cool tune featuring thumping bass and drum beats, subtle electronics, and astral flute work. There is a freaky combination of unsettling beats and melodies with the ethereal flute sound. "Off On A Current" is an interesting fusion tune that displays the band's musicianship better than any track from either album. Though "Migration Of The Snails" is musically more mature, I still to an extent enjoyed the playful, uninhibited explorations featured on the first album. And the tracks from the second album are no less synth-laden than the first. Recommended to Hawkwind completists and anyone interested in freaky electronic psychedelia. AI: How did Melodic Energy Commission come about? DX: In the mid 70's I was singing my songs and playing acoustic guitar in coffee houses. A new co-operatively run radio station was just starting in Vancouver and I got involved with the drama group. I brought them a story I had written and they helped produce a four episode intergalactic fantasy radio program. It contained many songs crudely recorded on their mono tape recorders. The overdubs were done by going back and forth between two machines. Lately I've been eyeing this yellowed manuscript as the elemental fuel for a feature length motion picture script. It's all about mythical beasts and music from outer space. It would be a treat to have Hawkwind appear in this movie. Also about this time I was working as live sound and light mixer with a fusion jazz group called Lion and the Child (The violinist, Rod Booth turns up later in the Melodic Energy Commission), working closely with the synthi-guitar set-up that George McDonald built. We spent hours before each gig, tuning oscillators in his PAIA kit synth and the ARP 2600. He had an interface that blended guitar with the synths and the controls were accessed by his dance movements inside the fields of his custom built Theremin. This was truly jazz from deep space that also included a marimba, gongs, tubular bells, Tibetan trumpet, saxophone, bass, piano and drum kit. As the sound mixer I would fly in a few sound collages, like a busy marketplace and a Volkswagen zooming across the stereo PA speakers. In 1977 I left all this to attend Art Collage in Nelson, British Columbia. I never completed the year and eventually cruised back into Vancouver with an idea to design a recording project called The Melodic Energy Commission of Collected Artists (MECCA). AI: The music on "Stranger In Mystery" is clearly exploratory, often playful, and continually changes direction. Did most of these tracks result from freeform jams, or would you call them compositions? DX: I chanced to meet up with the Franklin brothers, Mark and Paul, who had some recorders and their own house in Richmond. Paul was working in the film sound department at the CBC. I had just purchased a 4-track reel to reel recorder and we carried these tapes around to each others music rooms to add tracks. Almost all of the music developed from jams. Some were based on ideas brought in by individuals, but whoever was in the room at the time of creation was listed as a writer. It was a rare occasion to have everyone in a room together at the same time. The extremes of the textures were intensified by the complete lack of any obligation to recreate the sonic creature on stage. Mutation was the rule of thumb. Thus the name Stranger in Mystery was chosen to herald this collection of recordings. AI: How did you happen to hook up with Del Dettmar? DX: One day a friend phoned me up and said there was this musician I should meet so he sent him over to my house. It was Del Dettmar and he was just passing through Vancouver to go off into the wilderness to plant trees for some extra cash. He went out to his van and brought in his EMS synthi and Axe. We shared some musical stories and I told him of the Melodic Energy Commission. That evening we went over to the Franklin house and jammed. It just seemed that Del had about as much respect for established musical structure as we did, so the wizard got interested in twiddling those electro-dials for awhile. The next day he packed up his work boots and shovel to make his way off with the tree planting crew. He did however, leave us his instruments while he was away. We turned them on occasionally but couldn't really figure out how to play them. A month or two later Del returned, anxious to do some more playing. I can't remember how long he stayed in Vancouver but we ended up with some Grade A recordings of this wild man of synthi-swirls. Del was intrigued by George's Theremin set up and they spent a lot of time in free-space together. AI: What stands out musically for me on "Stranger In Mystery" is the classic tribal acoustic hippie-psych sound combined with the heavy doses of wild electronics. Was this intentional or a natural outgrowth of the synth musicians in the band? DX: Everyone came from a very different background. This I feel is the key element that created the Commission's sound, we were only trying to emulate the uncommon and everyone carried their own treasure chest of uniqueness. I was the leader that held the concept together and guided the music onto disc, but, mostly I was an entranced follower, quite willing to ride the tangents brought out by the sessions. I played the part of the acoustic hippie songwriter traveling through outer space riding on the dragons' back. I sang the songs while the space gypsies played instruments from their galactic travels. The tape recorder was always rolling and there's boxes of unfinished symphonies. Mark and Paul just transferred many old tapes to digital and left behind a large pile of oxide on the studio floor. Mark was responsible for doing a pristine job of transferring and digitally re-mastering the music for "Moonphase Compendium". Randy Raine-Reusch was another major influence on the sound. His background is 20C classical, European computer music and the early roots of world music. His main instrument at the time was an Appalachian lap dulcimer, although he never played it in any traditional fashion. Hooked up to a flanger and sometimes hitting it with a violin bow he showed us stylings of Indian ragas and the Javanese gamalan. Randy isn't a rocker with a musical toy from the Chinese gift store. He makes frequent trips to Asia to search out the almost obscure ancient instruments and their masters. His hobby is going to isolated villages and stressing how important it is to the rest of the world that these unique and rare instruments remain a part of their changing cultures. He has always been happy to apply exotic timbres and textures to the music of the Commission, as well as recently for the Cranberries and Aerosmith. AI: The music on "Migration Of The Snails" seems to be more developed and directioned, less playfully experimental than the debut disc. The vocals also have a more avant, performance art quality to them. There are even some overt fusion influences. What changed from the first to the second release? DX: Right after "Stranger in Mystery" was released everyone was excited about the possibility of doing a second album. Nobody expected the first one to actually become reality but I was persistent at editing and mixing the tapes. I arranged for a cover design and scratched up enough dough to bake the discs onto my own record label, Energy Discs. "Migration of the Snails" was a conceived album, as Paul and I decided to co-produce it and assigned everyone some homework. Plan a song each that was about Gastropods. The recordings still developed at the jam sessions but the song structures were less improvised. Mark came along with the title that was attached to a watery rhythmic texture that Kathleen Yearwood added singing and lyrics to. She sang it through a flute made from a large Kelp bulb brought back from the Oregon coast along with the poem. Del spent some time in the public library researching the aspects of gastropodal life and wrote a poem and music. Del actually sang the original track but the recorded voice he gave me was muffled and unrecorded. I couldn't get the melody out of my head so I sang it while riding bicycle through the countryside, added one more verse, came back into the studio and replaced his track. I still wonder if I should have left his voice there but who knows? AI: Why does "Moonphase Compendium" start with the second album followed by the first? DX: We felt that the structure of Migration was easier to understand for ears that are unfamiliar with the Melodic Energy Commission, so it's a way to get wet before the wild part of the ride begins. AI: Did Melodic Energy Commission ever open for, or play with Hawkwind? DX: No. We are more of a recording band and the early Commission only did about six live performances. They were all pretty much freeform jam sessions but we did a couple of theater gigs that involved projections, surround sound and staging. Paul Rudolph, ex-Hawkwind, ex-Vancouverite, returned to town and performed with Del, George, Paul Franklin and Randy. I stayed off the stage and mostly dealt with the sonic ambience and staging. AI: Was the Vancouver music scene open to the kind of music Melodic Energy Commission played? DX: We got collage radio play and sold quite a few records around town but most of the interest for our music came from Europe and California. Probably because of our influences. We were never able to, or never tried to, perform any of the recorded music on stage. Although some of the live recordings ended up on "Migration of the Snails". AI: Did Melodic Energy Commission tour extensively? Outside Canada? DX: Up until 1980 we toured the Kitsilano district of Vancouver and twice played downtown at a theater. In 1981 George McDonald and I made a plan to go professional! So we set up a soundproof music room and invited only 'serious' musicians who would turn up to rehearsal five days a week, for six hours a day. Nobody else from the original Melodic Energy Commission dared to join us but Del, Randy and Mark assisted in recording a single 45 rpm release called "Melody is Energy" that I wrote the lyrics to. We recruited Rod Booth on violin and Ed Van Benthem on drums. I got a bass guitar and learned to play it and sing (shout) at the same time. It was quite a change from singing softly into a recording mic. Within four months of writing and rehearsing songs we were up there on nightclub stages with loud monitors and smoke in our beers. We actually became quite popular and our biggest gig was as opening act for Captain Beefheart and his Magic Band to a sell out of 1500 people. Right after this we went into a studio to record the songs and months later didn't come out alive. I think the recordings conveyed the energy of the band but I never did like the mixes. Someday we may get around to playing with the tapes to put together a proper album with some of our rehearsal jams. The few cassettes that we made were called M=E/C2(squared). I feel the music tracks are extremely powerful with rocking tight arrangements. I guess if we were a European-based band we probably would have toured with Hawkwind and had a chance to play for a lot more people, but Vancouver is such a pleasant city and it's hard to consider going anywhere else. As a Canadian musician I've always felt alienated by the political border between us and the hugely populated America beyond the horizon. AI: Tell me about the new material you are working on and which of the original members will be involved. DX: Around Xmas of 1997 we staged an impromptu jam session in my studio apartment and all of the Commissioners that were in town showed up and brought some instruments. We rolled more than two hours of 8-track digital tape with some quality microphones. Mark took this tape back to Victoria and did a live quick mix, made a CDR for each of us and I've listened to mine a few times throughout the year. I really like 90% of that recording and think it captures a timeless moment by the side of the creative pool. With a proper mix and edit I think it would make an excellent CD of instrumental excursion. Even more to my liking would be to go wild with editing and overdubbing, to create another classic psychedelic, audio journey. Mark and I haven't quite connected on that one yet. I also have an almost completed CD 'Best of the never before released'. It'll probably be released as the Melodic Energy Commission, though in reality I am the only constant member. I know this because I have quit on many an instance and nobody has ever wished to take on the role of leader. So this CD will feature different songs and musical accompaniment supplied by many fine musicians I have played with over the years. I'm just finishing off the final 10 minutes. It will be based on a recording by Randy's 30-piece dijeridoo orchestra. It's partially dependent on when the laws of economics line up with the timely nature of the artistic statement. I've been living the music found on this album for 10 years so time is almost inconsequential, however, the plan is to finish it by April 1999. AI: Tell me about the motion picture you are working on. DX: Over the last five years I've become increasingly involved with video production, motion graphics and non-linear editing. I'm still searching for the right production collaborators to make a series of music related feature length dramatic motion pictures. The first one has been written and is in the pre-production stage. I've been working on it for three years as a part-time obsession. It's very close to being made and I already have the next two scripts blocked out. One is an updated semi-animated version of my earlier radio episodes complete with songs performed live in front of the camera's. I say, thank god for DVD's as a perfect distribution method for these type of productions. Film was always so politically cumbersome to get to theaters. Now that digital-based theaters are becoming more personalized the need for non mainstream choices is an ideal stage for all varieties of audio and visual artworks. I find movie making to be challenging enough to push me beyond my previous creative limits. 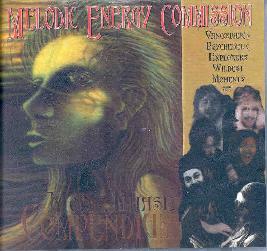 AI: Have you been involved with music in the years since the first Melodic Energy Commission albums? DX: Constantly, Vancouver is a major world port town and the music scene is vibrating with multipulus varied harmonics. I've been involved with recording and producing many acoustic world musicians, playing some of the oddities of imaginary instrument designs. I've worked extensively with Paul Serret (santoor), Kenneth Wells (sarod, quanoon), I have an ongoing musical relationship with Randy Raine-Reusch and consider my studio as one of his (globe-trotting) bases. I'm working on productions on a daily 'need-it' type of diet. Mostly as recording engineer and producer. I also do a fair amount of graphic design, CD covers, posters and video graphics. The concept of the Melodic Energy Commission is more alive than ever and if we had a proper record company, rather than relying on an always 'too etheric' business sense, all of our music recordings would be released and available. Does this sound like a gripings of lot of musicians? Fortunately, every moment creates a new stage for the spark of creativity to beam the dream. The major question that, as an artist, I have been struggling with over and over again is: If you're only a virgin once, can we really turn back? I know that the pool of creative energy is in a space beyond linear time. It's a good idea to visit it often and view the glow under the surface. The expression of this experience can take on many forms. For me, it's not always through music, but my resonating language is music. AI: Perhaps an uninteresting question, but I'm curious about the cd case. Its neither the standard jewel case, nor cardboard digipack. DX: Sometimes I'm just a very practical person. I have found a CD package that you can step on with the heal of your boot and then pick it up, wipe the dirt off and put it back undamaged onto your CD rack. Even though it costs a bit more than a regular jewel case, I think the package will last as long as the CD itself. That's not very long in cosmic time frames but an eternity to those in the present of the moment. It allows for fumbles and mistakes and it's easy to ship unbroken via snail mail. You can visit Melodic Energy Commission at their web page.